Clean out the coffee can. Find the seam in the side of the can, this will be the back of the bucket. To make holes for the handle, lay the can down on one of its sides. Stack scrap wood into the can until it reaches the other side. About 1/2 inch from the top edge of the can, drive the nail just through the can and barely into the wood. Wiggle the nail back out of the can and wood. Turn the can over and do the same thing to the other side. Using pliers, flatten the sharp edges around the holes, inside the can. Outside or in a well ventilated area, lay out newspaper and put the can in the middle of it, open side down. Continue to add coats of spray paint until the color is solid and even. Using acrylic paints, decorate your gift bucket. Paint freehand, or use stencils. Outside or in a well ventilated area again, lay out newspaper and put the can in the middle of it, open side down. Now spray it with a coat of sealer. Let dry completely. Cut a piece of wired ribbon the desired length for a handle plus 4 inches. Fold or bunch together one end of the ribbon and slip it through the hole from the outside to the inside. Tie a knot in the end of the ribbon about 1 inch from the end. Tie another knot over that one so that the knot is bigger. Trim the end of the ribbon up to 1/2 inch from the knot. Carefully pull the ribbon back out of the can until the knot rests snugly against the hole on the inside of the can. Fill your gift giving buckets with goodies and share! 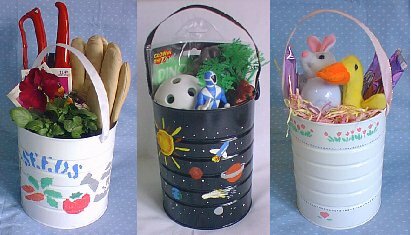 Makes a great personalized Easter Bucket! Fill with small gifts and put the coffee can lid back on to close the package.